Change things up this week and make these easy Traeger Grilled Shrimp Kabobs! 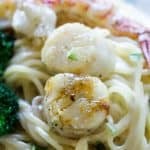 One of my favorite FAST meals, all of my kids (who can eat shellfish) LOVE these quick shrimp skewers, and the adults of the house do too. As you can see, my favorite way to eat these is over a giant Caesar salad. 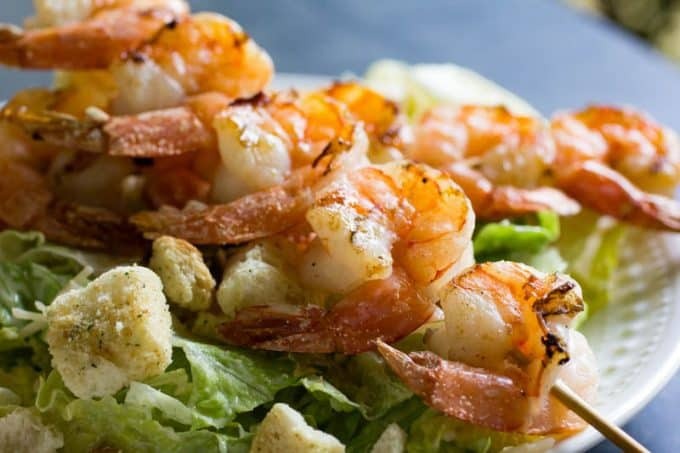 Shrimp on the grill allows you to serve up an easy meal that also feels fancy, and shrimp cook really quickly on the grill. Pair with a green salad or savory sides, and you have dinner ready in no time. If you haven’t ventured out and tried smoked shrimp on the grill yet, what are you waiting for? 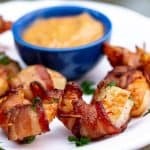 Nothing beats the flavor of shrimp off the grill, and these smoked shrimp kabobs are a flavorful way to prepare shrimp that your entire family will enjoy. You’ve seen my love of smoked shrimp a lot here. In addition to the Teriyaki Shrimp that I linked above, there is also Buffalo Shrimp too. Amazing. 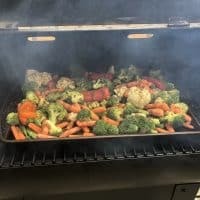 What I love about the Traeger Wood-Pellet grill is that while it can be used to get a big bold SMOKE on a nice cut of meat, it can also be used to just give items a kiss of smoke flavor too. That’s the right application for this grilled shrimp kabob. For these types of items, I don’t even run the wood-pellet grill on “smoke” mode. I just grill it like normal and because of the design it still gives it a little bit of a smokey flavor that I just can’t get enough of! 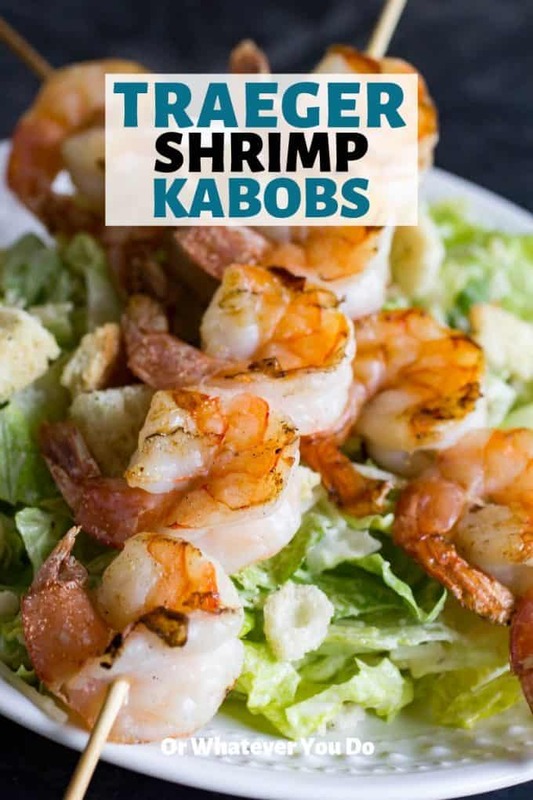 What Should I Serve With Shrimp Kabobs? I have so many opinions on this. 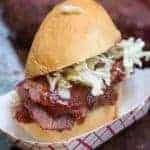 Top recommendations are definitely the Spicy Yaki Udon (skip the pork and use serve as a side with these shrimp), my Grilled Vegetable Pasta Salad, or our amazing Traeger Tri-Tip for a surf and turf that’ll beat any steakhouse you can find. What do you need to make smoke shrimp kabobs? 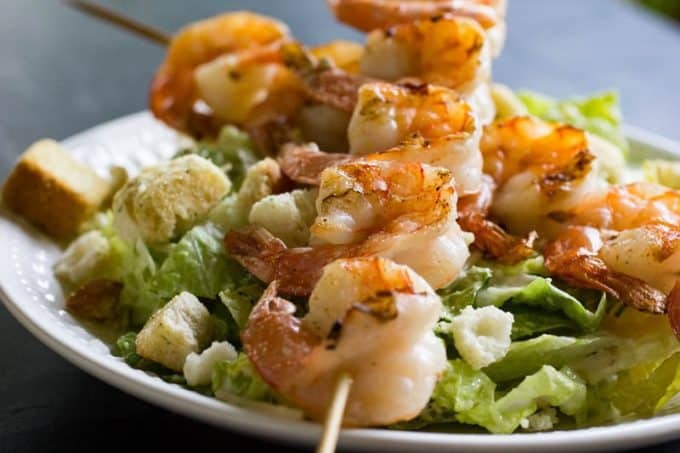 This recipe below is so simple to make and gives you tender, juicy, and super flavorful shrimp. The seasonings are simple. Just salt, garlic salt, and pepper are all you need. 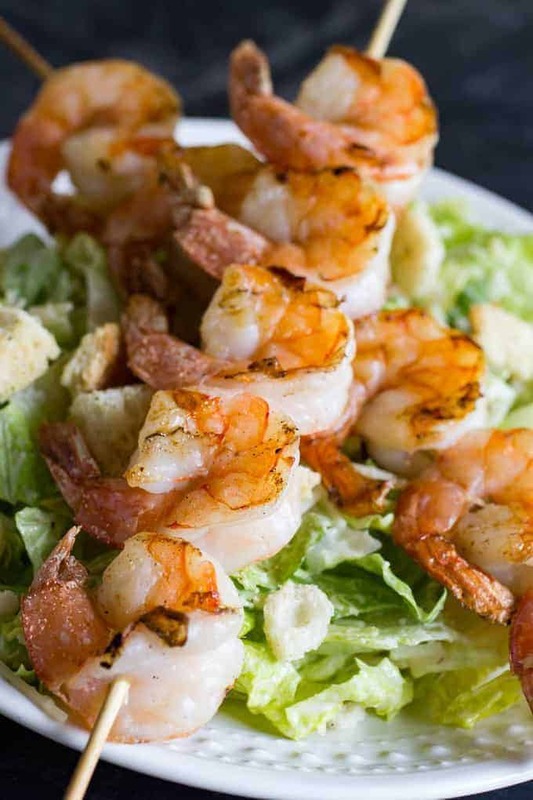 One thing about shrimp is that a little seasoning helps bring out the seafood’s flavors. You don’t need much, and staying with simple flavors compliment the shrimp so well. In the summer, especially, I usually make some kind of kabob recipe at least 2-3 times a month. This Traeger Grilled Chicken Kabobs recipe is a family favorite! 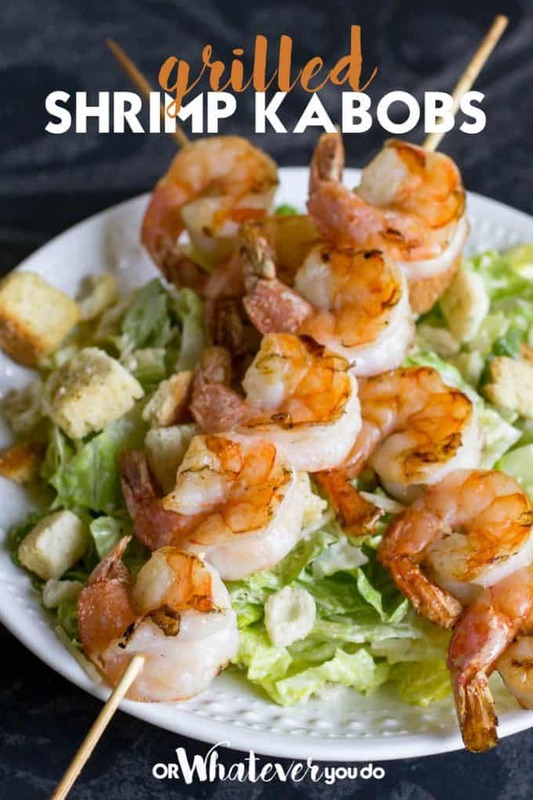 We love seafood in our home, and shrimp is one that I am always reaching for, especially when our grocery store has it on sale. Do You Need To Soak Your Skewers? One thing I learned with kabobs is that typically if you use wooden skewers, you want to soak them really well in water. If you are using a Traeger and won’t be grilling over 400 degrees and not for super long periods of time, you can skip it. If you’ll be grilling on high heat on a regular grill I’d definitely soak that. I generally start soaking them in water for about 30 minutes before you fire up your grill. If you don’t, on a traditional grill that gets well above 500 degrees in many cases, when you put your screwers on the grill they can burn up and possibly catch on fire. If they are saturated with water, the wood will stay wet through the cooking process and will withstand the heat. 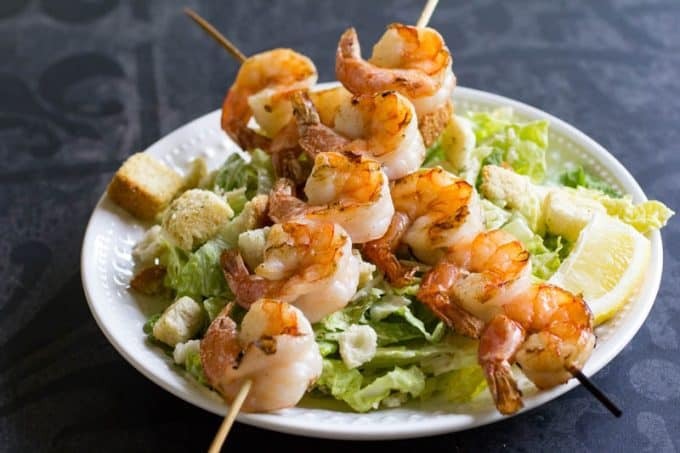 Buy uncooked shrimp and thaw well under cool water before skewering. If you have access to fresh-caught, never-frozen shrimp, well – I kind of hate your good fortune but use those and think of me while you do it. For grilling, getting a larger shrimp like the jumbo or colossal size is my recommendation. Smaller shrimp will cook faster and have less of a margin for error. What you are usually left with is super over-cooked shrimp. Larger shrimp allows a more even cook, and within minutes your shrimp is ready to be served. 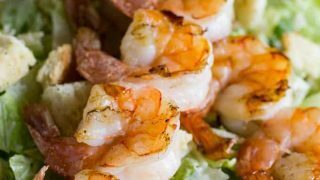 You can grill with or without shells on your shrimp. I prefer to peel the shrimp so that I can season it properly. I remove the shells and devein it, and then season with a dry rub or liquid marinade. Peeling the shrimp helps penetrate the meat better with the seasoning, so it is more flavorful. What should I do with the shells from peeled shrimp? If you are making a sauce though, save those shells and give them a quick saute in butter and use that in your sauce! 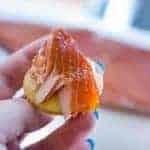 You can also give them a slow simmer in a bit of water to grab some of that awesome seafood flavor from the shells in your sauce. I’m a bit advocate for respecting the animals we are consuming by wasting as little as possible. Unless we are talking digestive tracts or some of the weirder organs. That’s where I peace out. Bizarre Foods contender, I am not. Plus, shellfish shells are filled with flavor! I NEED ALL THE FLAVOR. When grilling, if you have a grill that you can adjust the heat on you should aim for 375-400 degrees. Make sure the grill is preheated, and nice and hot. Shrimp is meant to be cooked on high heat and quick. Put your shrimp on the grill and cook it for 3-5 minutes (depending on the size of shrimp). Turn the shrimp halfway through the cooking process. You want the outside of the shrimp to be a pretty pink color. 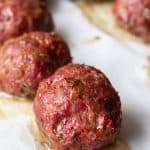 The meat should look white and have an opaque look. If you overcook the shrimp, it will become tough and rubbery. 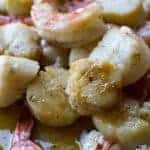 How Long Should I Marinate My Shrimp? Because I talk a lot about shrimp and share a variety of recipes, I sometimes get asked how long to marinate shrimp. 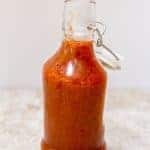 If you are using a liquid marinade that has some acidic components like lime, lemon, or even orange, you want around 30 minutes. The acid in these will actually start to cook the shrimp ceviche-style if you leave it too long. For a marinade that doesn’t have acidic components, an hour or so works well. An example of this is an olive oil marinade with herbs. 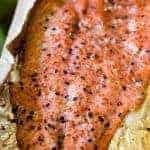 If it is a dry rub (like this recipe), you can give it some time while the grill heats up and then toss it on to cook. It doesn’t need the time to marinade like liquid marinades. I hope you enjoy the grilled shrimp kabobs with your friends and family! Delicious grilled shrimp kabobs are simple, fast, and a perfect way to highlight the complexity and fresh flavor of shrimp! Preheat your grill to 375, or as close as you can get if you are using a traditional charcoal or gas grill. Mix together the oil, salt, pepper, and garlic salt in a medium-sized bowl. Pat the shrimp dry with some paper towels. Toss your shrimp into the oil and seasonings to coat well. 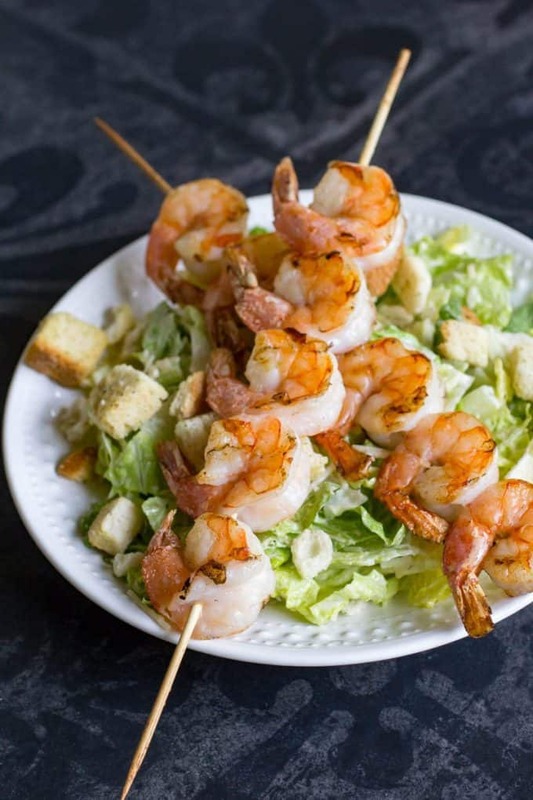 Skewer the shrimp and set aside. Place all of the skewers onto your grill, close the lid, and cook for 4 minutes. Open and flip the skewers carefully. Cook another 4 minutes, and remove if the shrimp is pink and the flesh is opaque.